A former New York City Chipotle worker is suing the Mexican eatery, claiming she was fired from her job because she took time off to recover from an abusive situation involving her boyfriend. She says in the suit that when she fractured her finger during an altercation with her boyfriend, she was punished for taking time off on the doctor’s orders. According to the New York Daily News, the woman said she returned ready to work after two weeks away, but her manager didn’t see things the way she did. Since then, she says she’s struggled to take care of herself and her three-month-old daughter. Bils are piling up, she’s in housing court for her apartment and things are generally not going well. She says she even brought in a police report and a record of her visit to the ER to her next scheduled shift after the incident with her former boyfriend, and received approval to take the time off. 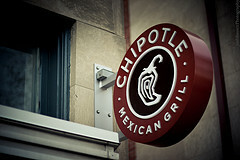 Chipotle is staying mum for now about the lawsuit, which seeks back wages, a new job and unspecified damages. And now she no longer sees a happy future at the company, one that she used to think about often.